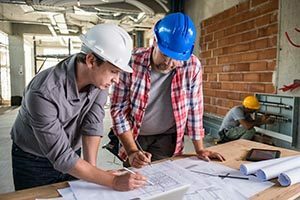 Business Insurance for General Contractors is different from other businesses due to the liability exposure from work done by sub-contractors along with the workers compensation exposure from their employees. There are even possible pollution liability exposures. Call us today for a review of your coverage. We've provided business insurance for General Contractors for over 50 years. General Contractors have a specialized set of insurance requirements. There are exposures from sub-contractors, the need for bid and performance bonds and construction projects to be covered by builder's risk coverage. Safety and loss control programs are a critical component of keeping insurance costs affordable tor General Contractors, and we work closely with our clients to implement these programs successfully. We provide General Contractor insurance in Miami, Fort Lauderdale, Palm Beach and anywhere else in Florida with a variety of "A" rated national insurance companies. Our agents will come to your business location at a time convenient to you. Contact us for a quotation on your business today! There are a wide variety of business insurance coverages available to cover the potential losses that can be suffered by general contractors. Our agents will take the time to review each of these coverages with you.